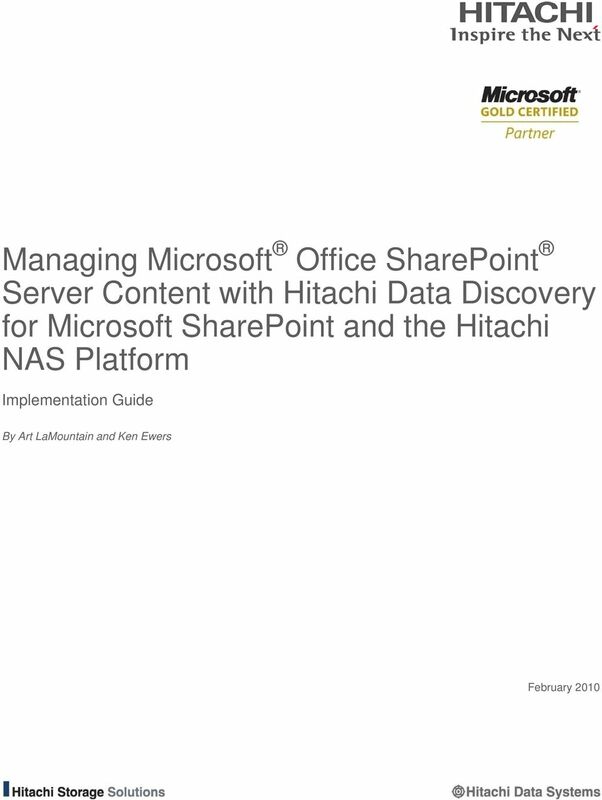 Download "Managing Microsoft Office SharePoint Server Content with Hitachi Data Discovery for Microsoft SharePoint and the Hitachi NAS Platform"
2 Summary As more content is added to Microsoft Office SharePoint Server libraries, SQL content databases can quickly grow, requiring constant review and analysis. 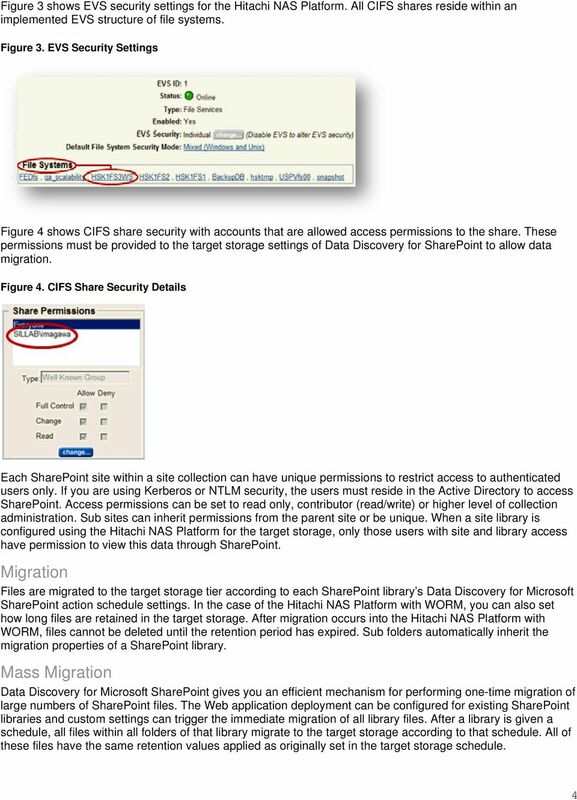 Left unchecked, this database growth can become a place a strain on backup window and recovery time objectives. 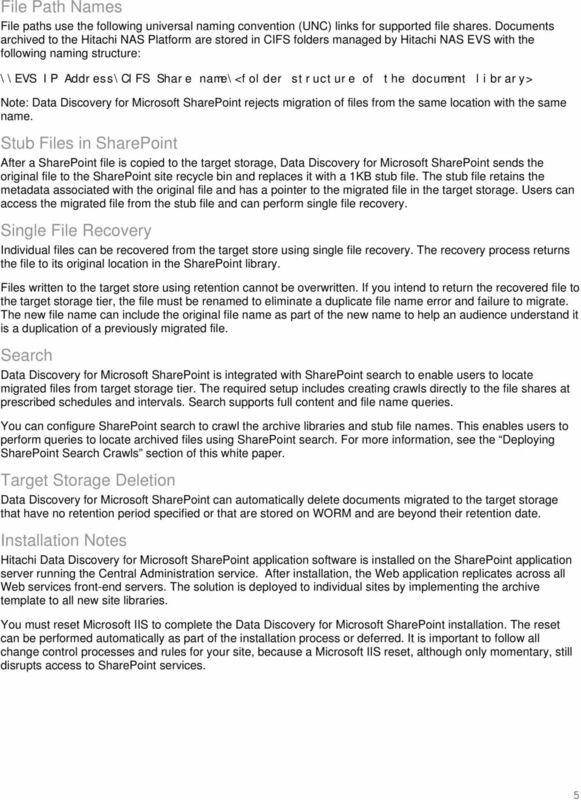 Maintaining infrequently accessed files on tier one storage resources can also raise the overall cost of the SharePoint infrastructure. 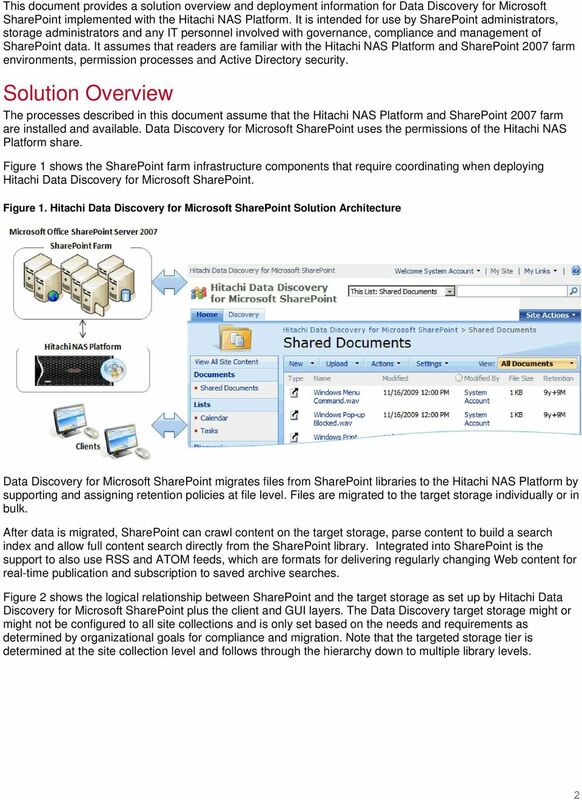 Hitachi Data Discovery for Microsoft SharePoint solves the problem of continually expanding SharePoint databases with integrated SharePoint workflows that archive or migrate content to the Hitachi NAS Platform, powered by BlueArc. 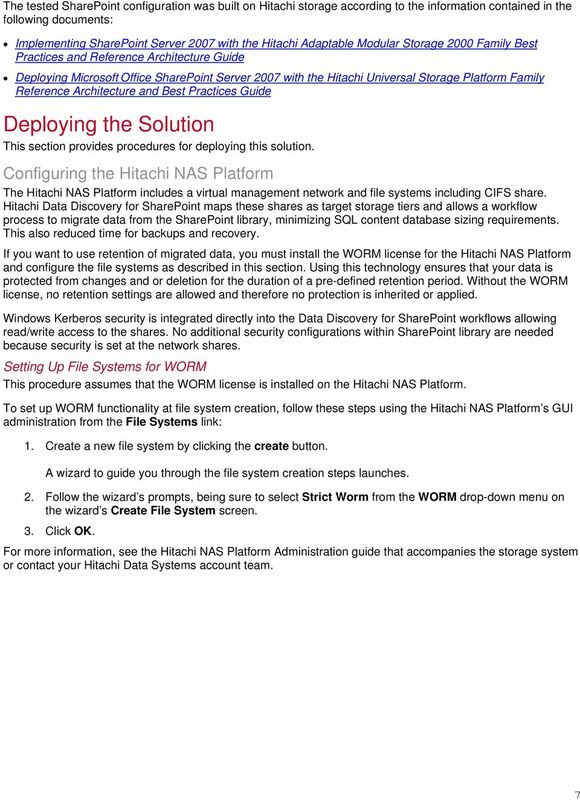 This also addresses the need for secure, long-term storage to satisfy compliance requirements and provides a single source for discovery searches for Hitachi NAS shares. 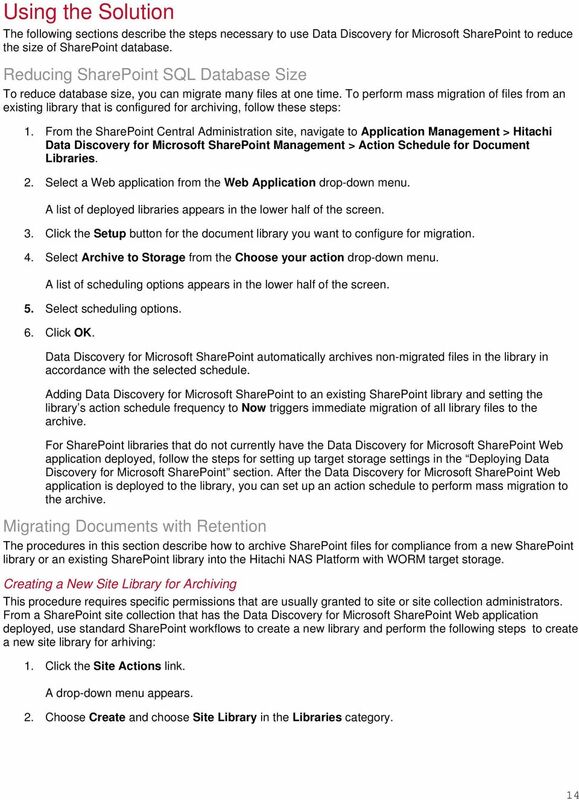 The solution described in this white paper allows you to reduce the size of production SharePoint databases, migrate files for compliance when used with optional WORM functionality, and support searches. 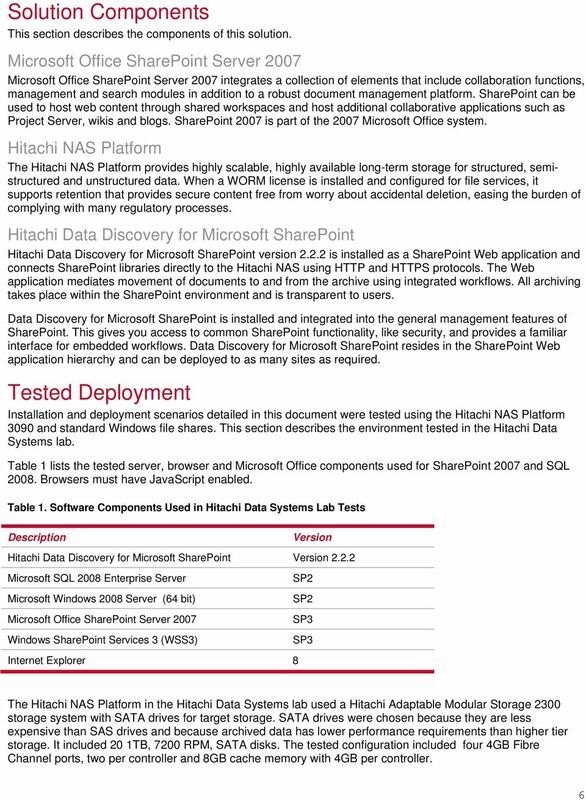 This document provides a solution overview and deployment information for Data Discovery for Microsoft SharePoint implemented with the Hitachi NAS Platform. 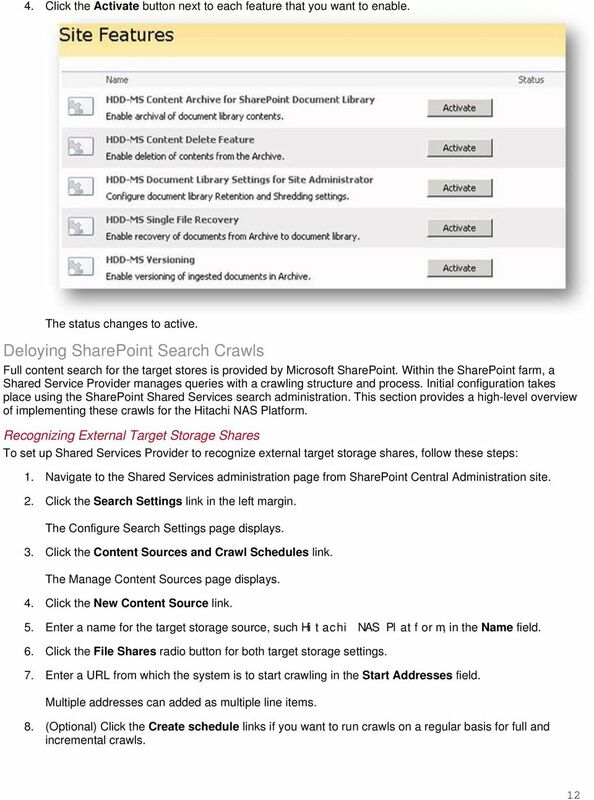 It is intended for use by SharePoint administrators, storage administrators and any IT personnel involved with governance, compliance and management of SharePoint data. 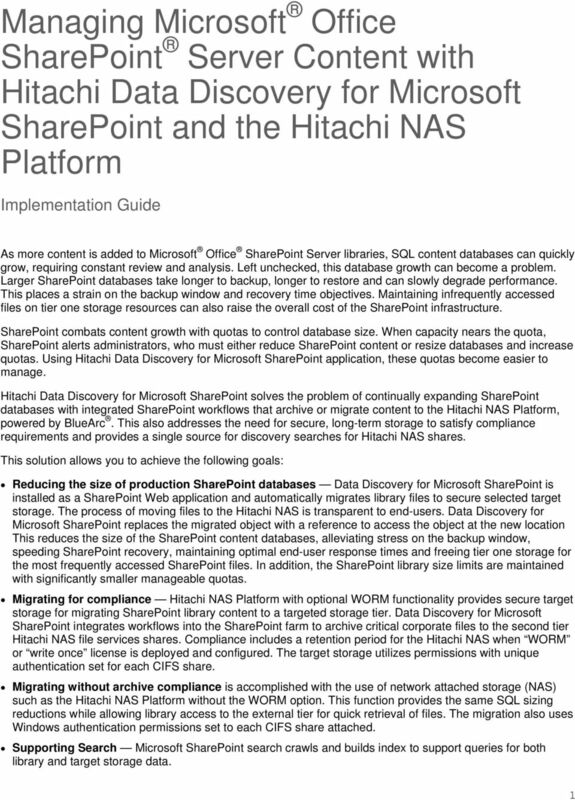 It assumes that readers are familiar with the Hitachi NAS Platform and SharePoint 2007 farm environments, permission processes and Active Directory security. 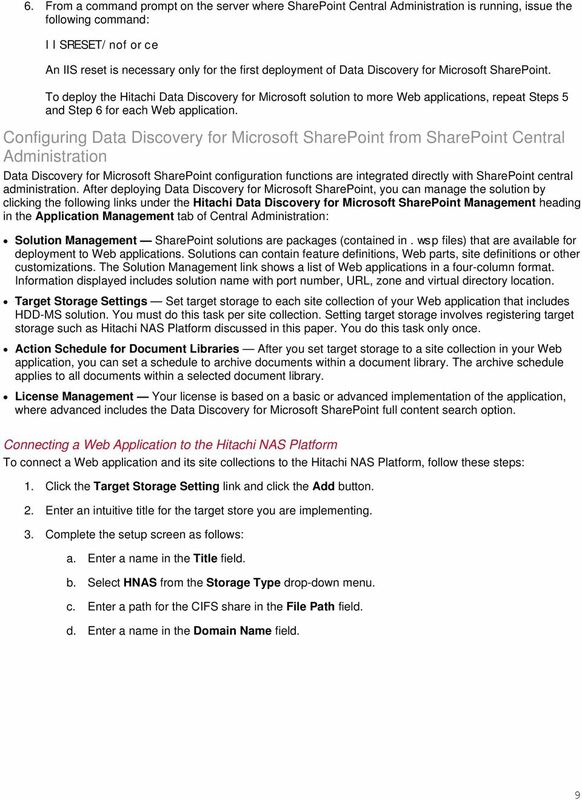 How to Scale out SharePoint Server 2007 from a single server farm to a 3 server farm with Microsoft Network Load Balancing on the Web servers. ControlPoint. 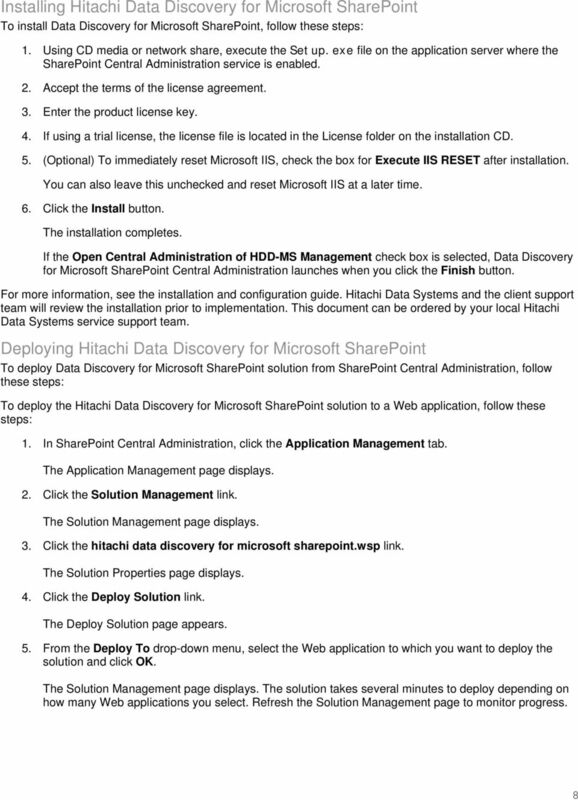 Advanced Installation Guide. Publication Date: January 12, 2016. Metalogix International GmbH., 2008-2016 All Rights Reserved. 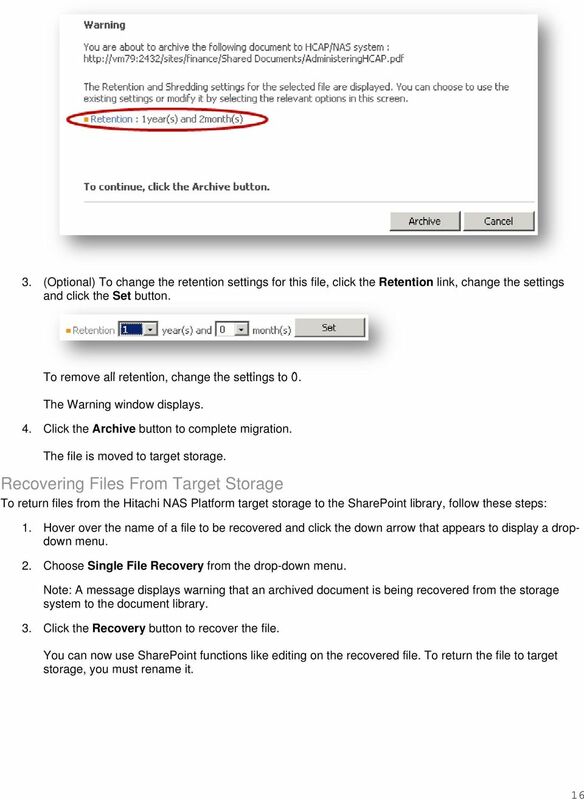 NovaBACKUP Storage Server NovaStor / May 2011 2011 NovaStor, all rights reserved. All trademarks are the property of their respective owners. Features and specifications are subject to change without notice. 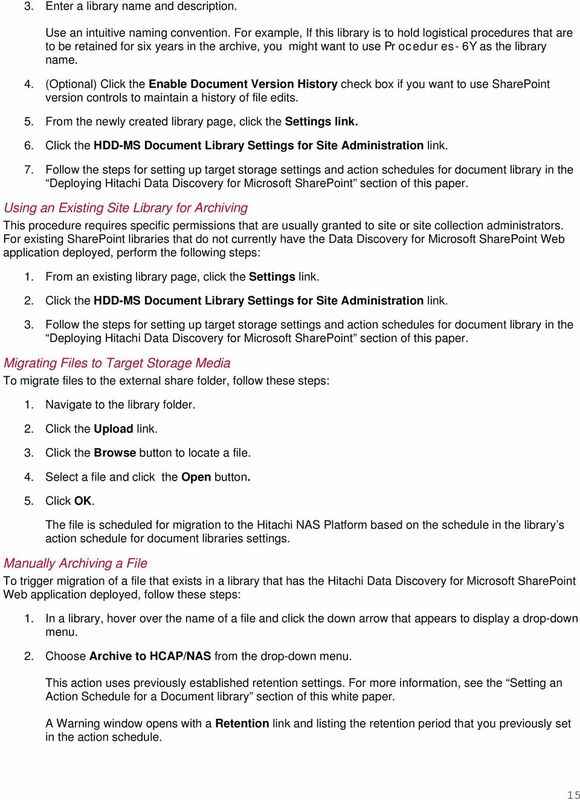 Microsoft Windows Storage Server 2003 R2 Getting Started Guide Abstract This guide documents the various features available in Microsoft Windows Storage Server 2003 R2. Rev 1. 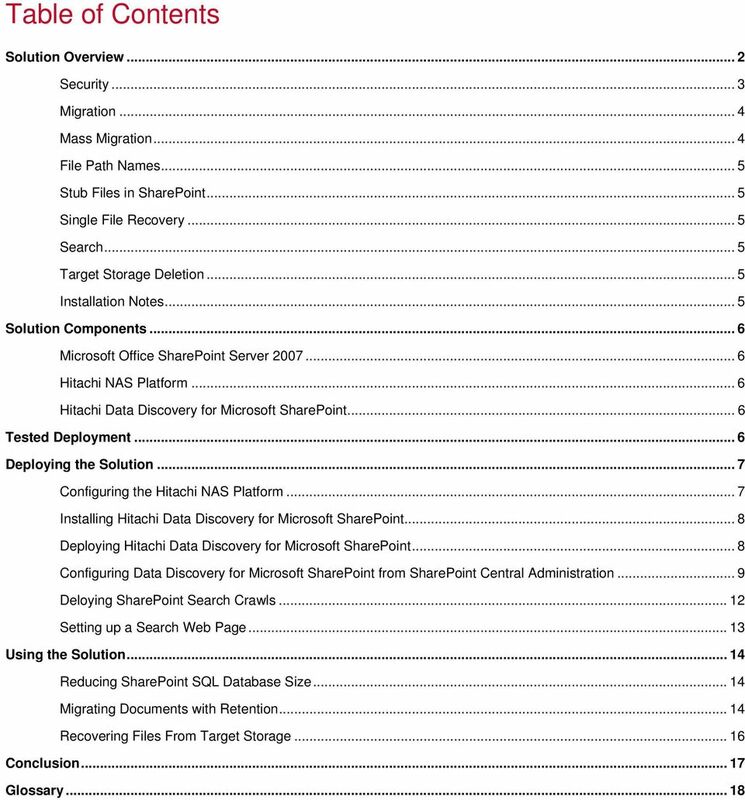 2005 Microsoft Corporation. 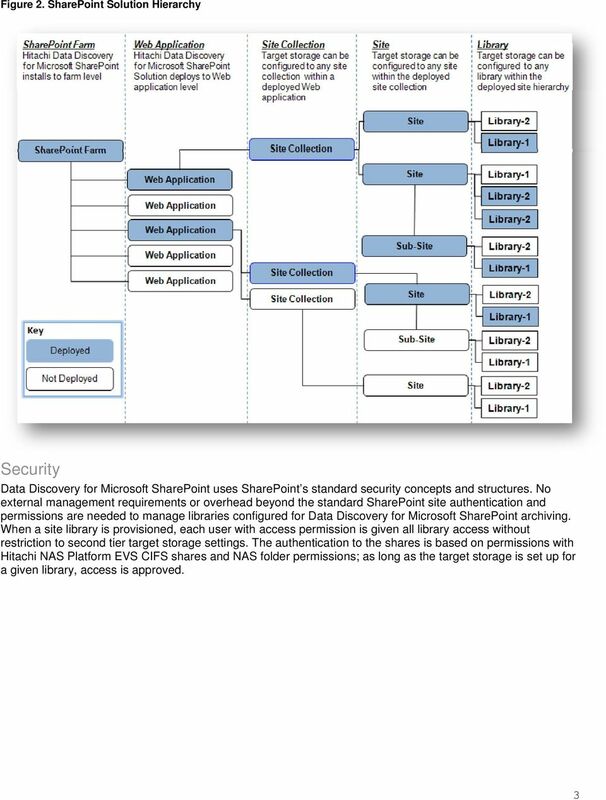 Basic Intro SharePoint Architecture Questions 1) What are Web Applications in SharePoint? 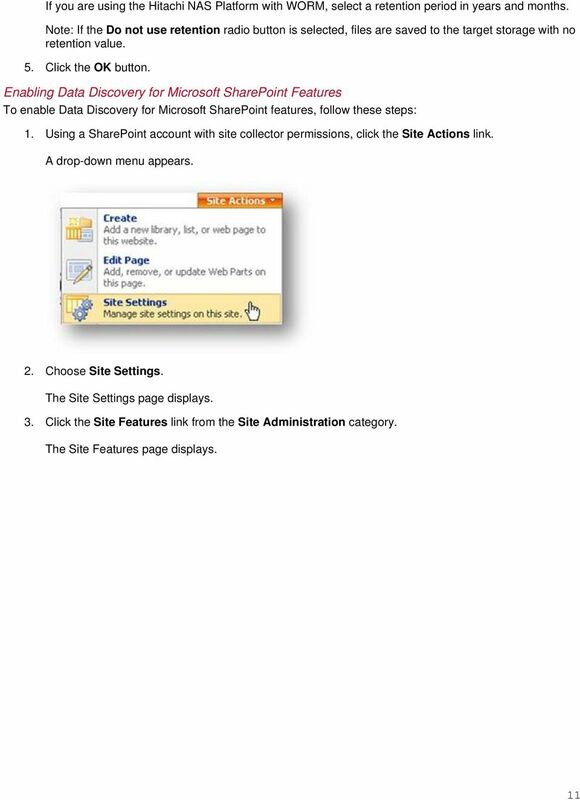 An IIS Web site created and used by SharePoint 2010. 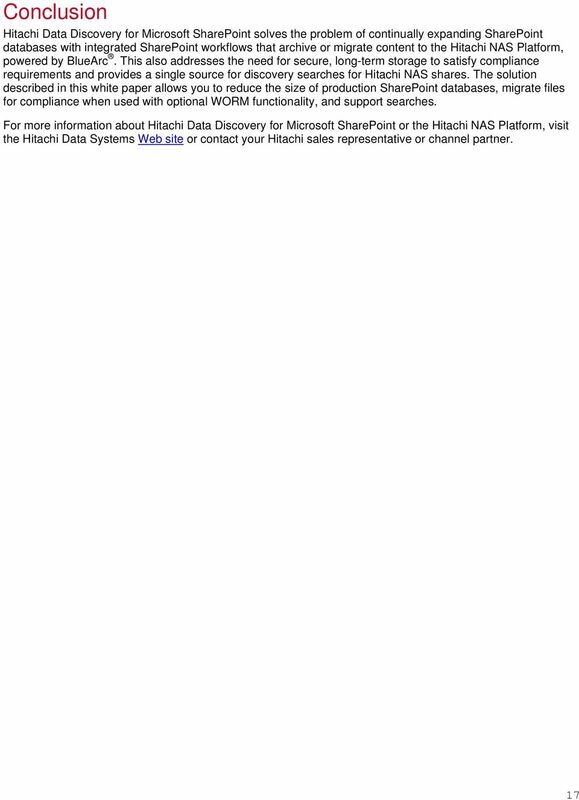 Saying an IIS virtual server is also an acceptable answer. Tenrox. 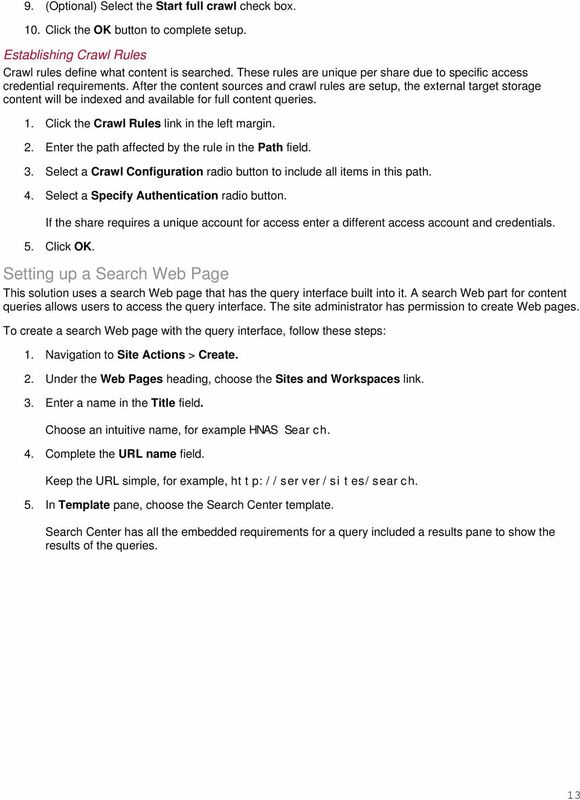 Single Sign-On (SSO) Setup Guide. January, 2012. 2012 Tenrox. All rights reserved. 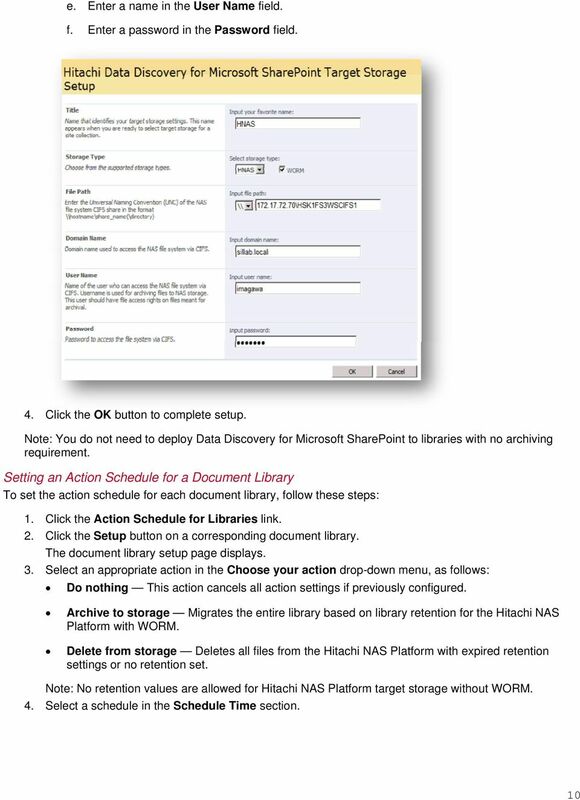 NTP Software VFM Administration Web Site for EMC Atmos User Manual Revision 1.1 - July 2015 This guide details the method for using NTP Software VFM Administration Web Site, from an administrator s perspective.